Dieppe is an important town on the Normandy coast. It originally developed in the 19th century as a popular tourist destination because it has the closest beach to Paris, although it is now better known for its port. The town centre has a historical section and although there are few major sights it is pleasant to explore. Much of the town was destroyed by a fire in 1694 so there are not many buildings from the medieval period to be seen and most houses date from the 18th century onwards. Further damage took place in Dieppe during the Second World War. 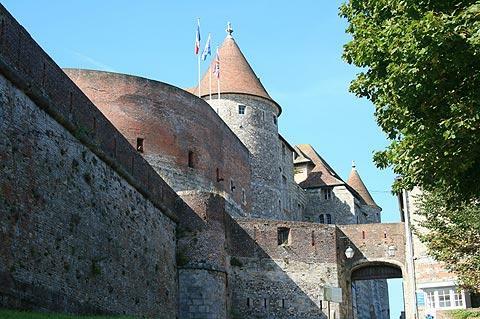 Despite this history, Dieppe has preserved and restored a substantial number of interesting buildings and monuments, even if there is also a good deal of more recent development. So for example on the seafront you can see the Royal Hotel and some historic houses, separated by newer (less attractive) buildings and around the pleasure port on Quai Henri IV there are lots of attractive townhouses. 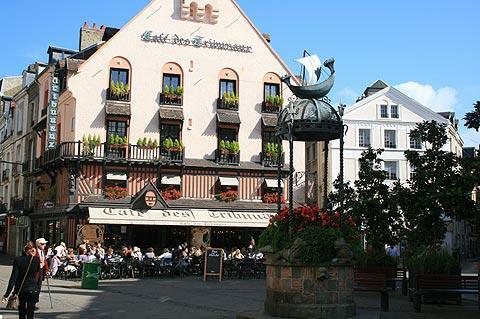 The Place du Puits Salé is the centre of the old town and a pleasant square to take a coffee break: it is here you can find the Café des Tribunaux which was once a popular haunt with painters and writers including Oscar Wilde when he was in exile, and is in a style we would more commonly associate with Alsace than Normandy. 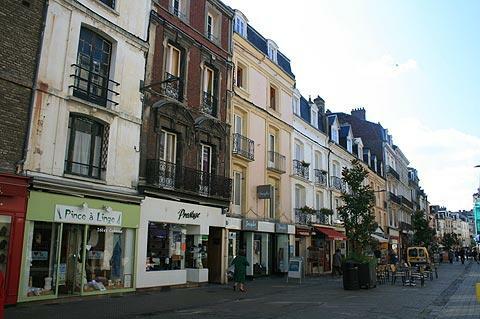 There are quite a lot of interesting stone houses and small squares here in the historic centre of Dieppe. 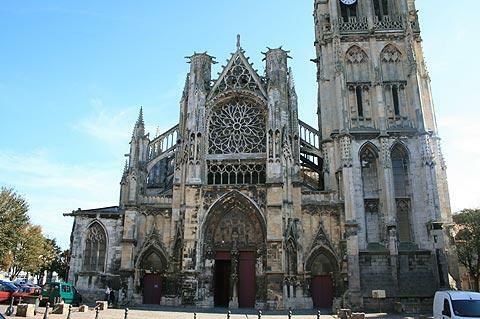 You can also see the churches of Saint-Remi and Saint-Jacques in Dieppe: both are attractive churches, and the Church of Saint-Jacques incorporates a great deal of ornate stonework. One very impressive half-timbered building, built in the 17th century even if it looks older, is the Maison Miffant on Rue d'écosse. The fishing port of Dieppe, the Quai Duquesne and the Quai Henri IV are pleasant places to stop for a coffee or for lunch at one of the restaurants lining the harbour. 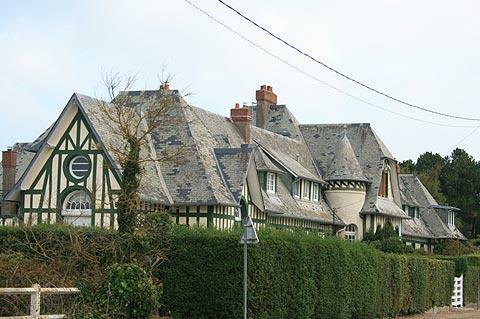 There are also several grand townhouses ('hotels') such as the College des Oratoriens and the Hotel d'Anvers, bearing witness to the 19th century glory days in Dieppe, around the two quais. The beach at Dieppe is a pebble beach at high tide, but a sandy strip emerges at low tide. Behind the beach there is a broad promenade and also a swimming pool in case the sea is too cold! One of the most popular attractions in Dieppe is the Estran Cité de la Mer. This has a very wide range of models and exhibits that explain everything you could ever want to know about the history of fishing in the region as well as the natural environment and a small aquarium section. 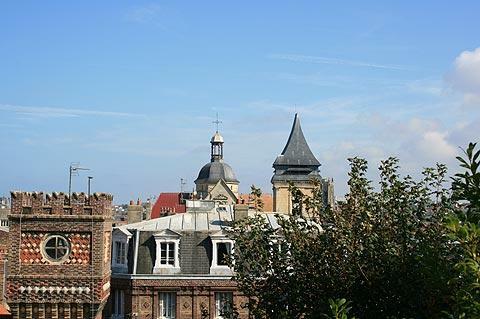 If you stroll through the historic region of Dieppe called Le Pollet, itself an interesting part of the town, you can continue to see the Church of Notre-Dame-de-Bon-Secours (or you can drive to the church). The church was built on the cliffs to the east of Dieppe in the 1870's as a centre for pilgrims but is now a centre dedicated to sailors who have lost their lives at sea. After admiring the extensive views across the town and beach from the chapel you can go inside and see numerous plaques and tributes to the sailors. Near to Dieppe at Varengeville is the Bois des Moutiers. 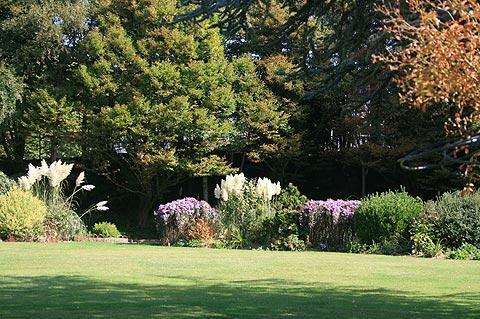 The house was designed by Edwin Lutyens and the gardens were designed by Lutyens in collaboration with Gertrude Jekyll. The park and gardens lead to the sea and contain a mass of rhododendrons, azaleas and hydrangeas and has a wonderful pergola - a common sight in gardens which Lutyens and Jekyll collaborated on.